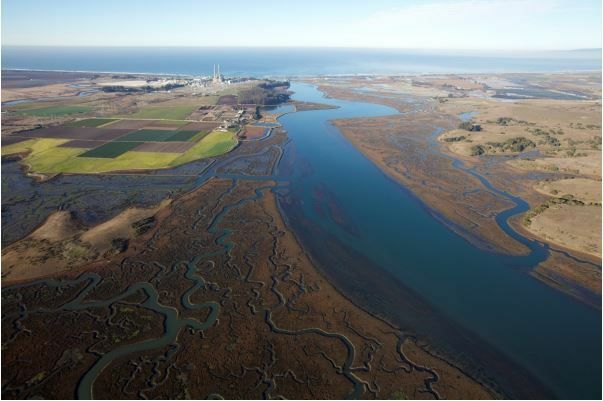 The United States of America has designated Elkhorn Slough, the largest estuary on the central California coast, as its 39th Wetland of International Importance. The Site (Ramsar Site no.2345) harbours the largest tract of salt marsh in the state of California outside of San Francisco Bay/Estuary (Site no.2097). The Site is a seasonal estuary comprised of intertidal marshes, mudflats and seasonal brackish pools. The Slough harbours eelgrass beds as well as oyster communities, which provide valuable fish nurseries, and the intertidal mudflats nourish migratory shorebirds. These distinctive estuarine communities are among the rarest and most threatened habitat type in California, which has lost approximately 91% of its wetlands in the last 100 years. This biologically rich estuary provides habitat for more than 340 species of birds, with more than 20,000 waterbirds, more than 500 species of invertebrates, and 100 species of fish, including the representative bat ray (Myliobatis californica) and leopard shark (Triakis semifasciata). It also provides key habitat for more than 100 individuals of southern sea otter (Enhydra lutris nereis) that feed, nest and nurse in the area. This wetland also provides diverse ecosystem services such as pollution control, climate regulation, food provision, and recreational, educational, and research opportunities, attracting thousands of birdwatchers every year. The Site has also been designated as a Globally Important Bird Area by the National Audubon Society and as a Western Hemisphere Shorebird Reserve Network of Regional Importance.